The Bourgault 9800 Rigid Hitch Chisel Plow stands up to the claim of being the strongest chisel plow in the agricultural industry. Hitch with Attitude - The rigid hitch is designed for power transfer and operating stability. Strongest Chisel Plow Frame - The 9800 RHCP has a four row frame design with available shank spacings of 8" (203mm), 10” (254mm), 12” (305mm), or 15” (381mm). Handle Maximum Residue - Bourgault chisel plows are legendary for residual clearance. Transport with Confidence - The narrow center frame and over-center folding give the 9800 a narrow transport width. Stabilizer Wheel Option - Maintain even operating depth in high draft conditions. Convenient Tongue Adjustment - A wide range of settings will let you set the tongue height where you need it. Side-to-Side Adjustment - Simple adjustments available to ensure even depth across the width of the unit. Dependable Hydraulics - Bourgault incorporates a superior hydraulic design. 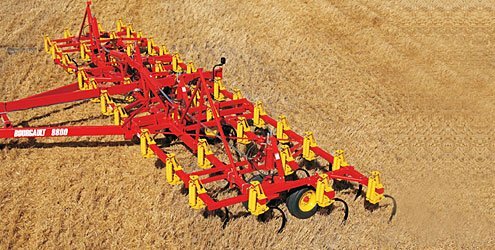 Bourgault Trailing Hitch - The Bourgault 9800 Rigid Hitch Chisel Plow is designed for towed implements such as fertilizer caddies or anhydrous ammonia carts. Standard: High floatation single axle; Optional: Offset walking tandem axles. Quick-Change and Speed-Loc adapters are optional. Refer to Bourgault Tillage Tools for optional openers. Impact Blockage Monitors available for secondary or tertiary lines. Optional 3 or 4 bar harrows.